We already know that the shelling kills people, but I am seeing what a broken economy does too. People have been left so desperately poor that they kill themselves before the hunger does. 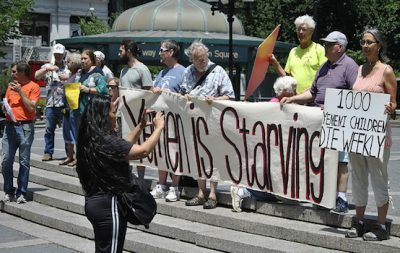 The economic war being waged against the civilian population is often overlooked in coverage of Yemen’s humanitarian crisis, but it is one of the major reasons why almost 16 million people are food insecure even with humanitarian food aid and more than 20 million are food insecure without it. Of those, there are 1.7 million people in the Taiz region that are at crisis, emergency, or catastrophe levels of food insecurity, and that’s with humanitarian food aid. Approximately the same number of people in the Hodeidah governorate are enduring the same deprivation. More than two-thirds of the population of Hajjah governorate in the northwest are suffering the same hardship. More than half of the country’s entire population is in the same position, and conditions are going to keep deteriorating unless the war is brought to a halt and the economy is stabilized. Yemenis will be living with the costs and burdens of conflict for years and decades after the war that has been waged on them finally ends. It is an enduring mark of shame that our government has helped the Saudi coalition do this to them. It is imperative that our participation in perpetuating this disaster be brought to an end.